Have you ever found yourself sitting in a meeting (literally) while figuratively sitting on an idea that you think would be constructive or useful to the rest of your team? What is it that stops you from raising your hand in a group setting and giving your thoughts a voice? Are you an introvert? Have your ideas been shot down in the past? Maybe you are concerned that your opinion will cause conflict and damage your reputation. Whatever your reasoning is for not speaking up, it all boils down to one truth—speaking up in a meeting (or even in a group email) and putting your thoughts, concerns, or opinions out there can be downright intimidating. Not only are you opening yourself up to criticism, but you are also making yourself vulnerable in a setting where you should be demonstrating your strength and confidence. However, it is also true that a crucial part of being a part of a team is contributing your ideas and participating in group discussions. You are an integral part of a team who was hired for a reason—why shouldn’t your ideas be heard? If you typically sit on your ideas rather than sharing them, here are a few tips on how to start voicing your ideas in professional group settings. 1. Start small. If voicing your opinion in a group setting makes you nervous, start small. Rather than jumping in with big ideas and statements, start with some smaller suggestions and observations. Starting small will help you to learn the best way to communicate your ideas to your team before tackling larger, more controversial topics. 2. Decide if you are adding to or detracting from the conversation. Perhaps the reason that you are not jumping at the opportunity to share your thoughts is because you are still trying to decide if they are pertinent and align with the purpose of the meeting. If this is what is keeping you from speaking up and sharing your thoughts, take a moment to reflect on how closely related they are to the meeting’s objective. If you come to the conclusion that what you have to share is off topic, sit on it for a bit longer and bring it up at a more appropriate time. 3. Build your audience. If speaking in a group setting causes you anxiety or you are nervous about how well your message will be received, try building your audience gradually. Rather than introducing an idea for the first time at the weekly staff meeting, start having conversations with your coworkers individually and gauge their reactions. Not only will this give you an opportunity to practice expressing your ideas in a less stressful environment, but you may even go into a meeting knowing that you have the support of your coworkers. 4. Gain knowledge. 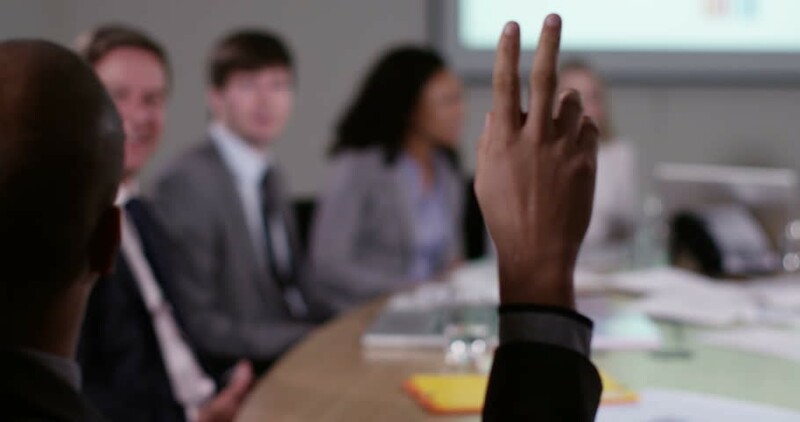 Knowledge is power, and being knowledgeable can make you feel powerful— maybe even powerful enough to raise your hand in a meeting… Go in knowing the purpose of the meeting and the agenda. With that knowledge, decide if you have any comments about the items on the agenda that you feel need to be brought up. That way you can ensure that your comments are well thought out and on topic. 5. Stay professional. While you should share your thoughts and opinions with your coworkers, it is necessary to maintain a level of professionalism that allows others to be receptive to your message. This can be difficult, especially if you are passionate about the topic being discussed; however, becoming overly emotional will be what your coworkers remember rather than the ideas that you were attempting to express. 6. Listen to feedback. Not only should you be able to voice your opinion, but you should also be open to hearing feedback and the opinions of your coworkers. That is what builds strong morale and a strong team. The next time that you have a meeting at work, keep these tips in mind. You may find that raising your hand and sharing your thoughts with your team members isn’t as intimidating as you thought it would be.